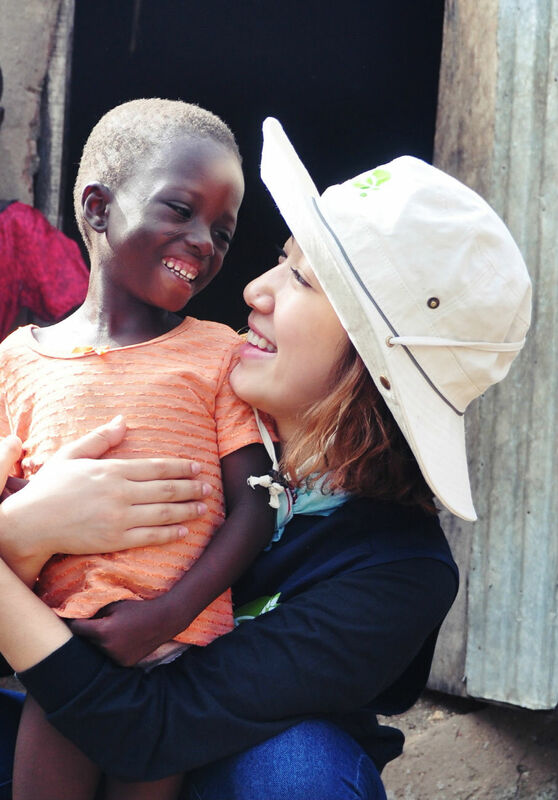 Actress Park Shin Hye volunteered in Ghana for 8 nights 9 days. Appointed as Goodwill Ambassador of non-profit organization Korea Food for the Hungry International (KFHI) in May 2011, Park Shin Hye takes part in the 16th World Food Day 2011 by spearheading the volunteer campaign "STOP HUNGER" with KFHI in Ghana. Setting off to the faraway land on 24th, Shin Hye stayed in a poverty-ridden town where children suffer from cruel starvation and malaria. KFHI's mission was to alleviate the food shortage problem there by giving out food kits. The volunteers also gave our mosquito nets and warm clothing to the children as well as bringing sick ones to the hospital for treatment. A special friendship bloomed between Park Shin Hye and a little girl called Abanna (아반네). The 5 year old native lives with her grandmother in the village and has no parents. 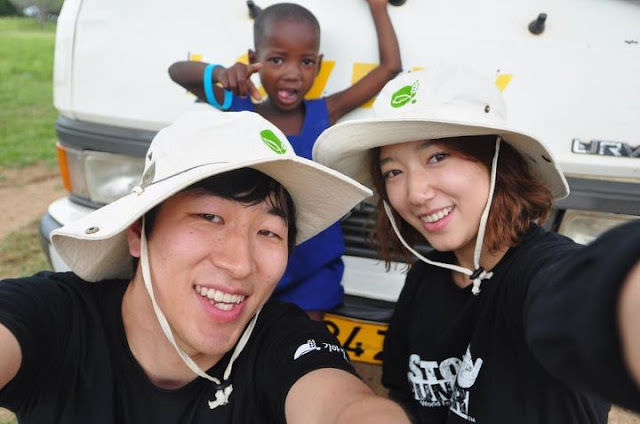 During her volunteer trip, Park Shin Hye served as a 'mother' for Abanna. She helped the kindergarten child take baths, served and ate meals with her and went to school with her. Although time was limited, a lot of precious memories developed. Abanna was very, very happy. With serious lack of food, water and nutrition, Abanna looks significantly smaller than normal 5-year-old children. But the bright smile never left the child's face. Reflecting on her experience, Park Shin Hye says "I was very happy to have the chance to be a mother of a child, but it also hurts my heart a lot. The result of our little attention and assistance towards these causes is witnessed through this child. For these people, they have nothing. Hope, warmth and love are what they need. I wish I could give them more." This was Park Shin Hye's 2nd time volunteering in a 3rd world country. After filming drama 'You're Beautiful' in 2009, the young actress set off to Nepal for a volunteer trip. This year, after filming drama 'Heartstrings', Park Shin Hye decided to participate in volunteering in Ghana. "I want to give love," she says. In daily life, Shin Hye also engages actively in volunteer work such as in 'Habitat of Humanity' services. Park Shin Hye's participation in the Ghana volunteer program will be broadcast in the form of a documentary on October 15th (Saturday) on MBC '2011 World Food Day Special - KFHI STOP HUNGER Campaign Sharing'. What makes her more beautiful is her good heart and sincerity to the oppressed. I admire her for her mature views in life unlike most kids at her age who only enjoy all the glorious things in this world. Godbless her and wish her the best she truly deserves. wow, PSH is such a kind lady. Great job and keep up your great work. We look forward to watching this program on TV. wow god bless this princess always praying for the best for you .... heart of an angel cant wait to see more of you psh.....any news of new drama or anything? awwwwwww I'm super touched. She was Abanna's mama for the time she was there. :( She has such a great heart. I'm sure it was heartbreaking to leave Abanna and Ghana. I'm so proud of her. She has good heart. Willing to travel 3/4th of the world to volunteer. Our supergirl!! I hope there were more Park Shin Hyes in this world. Your kindness and humility sets you apart from what is the "norm" today. God bless you Shin Hye! she's such a great gal!! !